Inexpensive automating. Simple to implement. Reduction of errors. Improves security on the premises. Low maintenance costs. Automated trilateral stacker crane to replace manned trilateral forklifts. The automatic trilateral stacker crane is a fast an economical way to automate warehouses. The automatic trilateral stacker crane: a fast an economical way to automate warehouses. 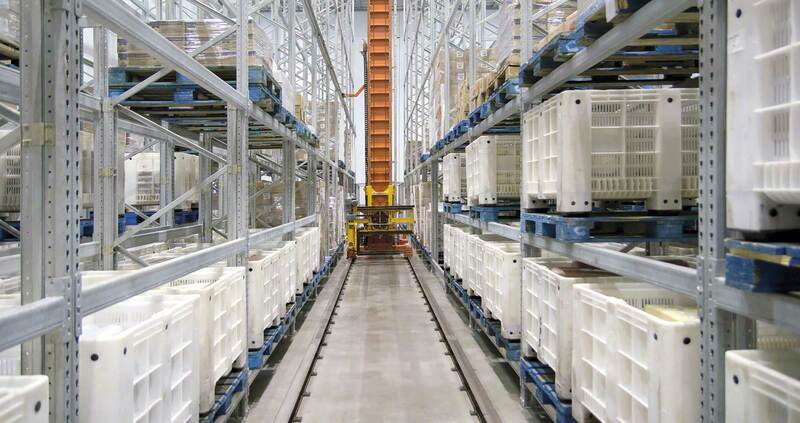 The perfect solution to automate conventional racks of up to 15 meters in height. No need to modify the warehouse structure. Why use an automatic trilateral stacker crane? Adapts to all pallet warehouses with man-operated elevator trucks. Economical automating. The investment is paid off quickly. Easy to implement, both in new and pre-existing warehouses, since it doesn’t require any changes to the warehouse structure. Decrease in personnel costs. It allows you to manage all the pallet movements without a man on board. Using all available space since it does not have a top guide and it can pick up pallets from level 0. Reduces errors since it is an automatic system. Improves safety in the facility. Operators do not work in the passageways meaning the system is safer and reduces the risk of accidents occurring. Easy to integrate the automatic system connecting it to a warehouse management system like Easy WMS. Automatic trilateral stacker crane make it very easy to automate warehouses with conventional racks where a man-operated elevator truck is used, both in pre-existing warehouses and in new facilities. The stacker crane moves the pallets to the extremes of the passageway leaving the cargo on a rack or automatic transport system. This is possible since it has a rotating head enabling you to pick-up and leave pallets in three positions: one frontal and two lateral. The automatic trilateral stacker crane, guided on three rails, only has four supporting points on the ground. It has no top guide, making it easier to install in any warehouse where elevator trucks are usually used. It also adapts to virtually all spaces for direct access to the pallets. It is totally automatic and all the movements of the stacker crane respond to storage and extraction orders sent by a control system that optimizes these movements. Jaume Segrià, Operations Director of Disalfarm. Disalfarm is an example of how any warehouse using trilateral elevator trucks can be automated without changing their structure and with a very fast return on investment.